Our collaboration with Gofinland, Finland's largest marketplace for rental cottages, began in spring 2016. Since then, I've created optimised and compelling web content throughout their Finnish and English platforms. 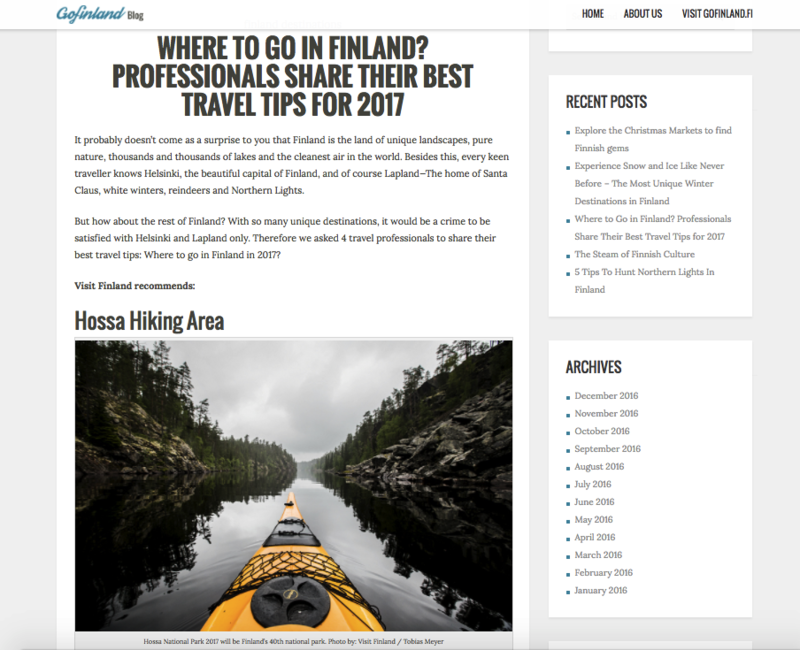 Gofinland Blog targets international travellers and introduces Finland as a diverse and exciting travel destination. "It probably doesn’t come as a surprise to you that Finland is the land of unique landscapes, pure nature, thousands and thousands of lakes and the cleanest air in the world. Besides this, every keen traveller knows Helsinki, the beautiful capital of Finland, and of course Lapland—The home of Santa Claus, white winters, reindeer and northern lights. But how about the rest of Finland? With so many unique destinations, it would be a crime to be satisfied with Helsinki and Lapland only. Therefore we asked 4 travel professionals to share their best travel tips: Where to go in Finland in 2017?"